Be the first to share your favorite memory, photo or story of Patricio. This memorial page is dedicated for family, friends and future generations to celebrate the life of their loved one. Patricio “Pat” Montano was born March 17, 1985 in Tlahualilo de Zaragoza, Durango, Mexico to Juan Montano Esquivel & Maria Gradalupe Ponce. 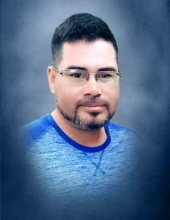 His life was tragically cut short July 16, 2018 in Jal, New Mexico at the age of 33 years. A celebration of his life will be held at 10 A.M., Tuesday, July 24, 2018 at the Walters’ Buffalo Funeral Home in Buffalo, Texas. Interment will follow in the Buffalo Cemetery. A public visitation will take place from 10 A.M. to 8 P.M., Monday, July 23, 2018 at the funeral home. Pat was a man who loved his daughter, Lili, and son, Esgar, with as much love and adornment that the world’s greatest dad would. This is because he knew his time was limited due to his work as a straw boss with AEG Pipeline Company in Jal, New Mexico. Pat loved his work, but he hated being away from his large family. Everyone knew Pat as being the type of man who loved to cook for anyone and everyone. He always looked forward to the end of the work day when he was finally able to bar-b-que and have a few “cold ones” with his buddies. Pat was the life of the party, always smiling and joking, not to mention that he was the greatest dancer! There was never a dull moment when one was in Pat’s company. Pat was the family member, and friend that when called upon, was ready to help with whatever someone needed. Enjoying a “cold one” afterward as payment was always welcome. Family meant everything to Pat. There was never a moment when he didn’t want to spend time with his family, wife, and most of all, his children. He enjoyed fishing, shooting guns, working on projects with others and making lasting memories with his children. He also loved to work, as well as, make the work day enjoyable for his coworkers. Perhaps Pat’s most admirable quality in which he possessed was his happy and positive attitude, which was evident from the moment he woke up in the morning. He wanted to enjoy every minute of his life. Pat was preceded in death by his brother, Esgar Montano. He is survived by his parents, Juan Montano Esquivel & Maria Guadalupe Ponce; wife, Angel Renee Montano; children, Liliana Montano (11 yrs.) & Esgar Montano (5 yrs. ); step-children, Makayla Cunningham (17 yrs.) & Chon C. Cunningham (18 yrs. ); siblings, Alicia Montano, Amalia Cervantes, Juan Montano, Clara Esquivel, Duvi Soria, Gustavo Montano, Eliceo Montano, Felicita's Martines, Junior Montano, Crystal Gallegos & Andres Montano, as well as, numerous nieces, nephews, aunts, uncles, cousins and friends. To send flowers or a remembrance gift to the family of Patricio "Pat" Montano, please visit our Tribute Store. "Email Address" would like to share the life celebration of Patricio "Pat" Montano. Click on the "link" to go to share a favorite memory or leave a condolence message for the family.